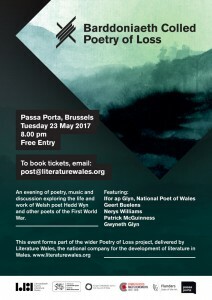 Literature Wales will host an evening of poetry, prose, music and discussion at Passa Porta, the International House of Literature, in Brussels on 23 May 2017. The event forms part of Barddoniaeth Colled | Poetry of Loss, a year-long project commemorating the First World War and Welsh poet Hedd Wyn, who was killed on the battlefields of Flanders in 1917 just a few weeks before he was posthumously awarded the Bardic Chair at the National Eisteddfod. The event in Brussels will explore the life and work of Hedd Wyn and other poets of the First World War as well as presenting contemporary responses to their work. The line-up includes: National Poet of Wales, Ifor ap Glyn; Flemish poet, critic and essayist Geert Buelens; writer and musician Gwyneth Glyn; poet and academic Nerys Williams; and multi-award winning novelist Patrick McGuinness. Literature Wales’ Chief Executive Lleucu Siencyn will open the event. Nerys Williams is currently undertaking a three-week literary residency in Brussels, exploring the parallels between Hedd Wyn and Irish poet Francis Ledwidge, who both died in Ypres on 31 July 1917. During her time in Flanders, Nerys will visit the area surrounding Artillery Wood, where both poets are buried. Barddoniaeth Colled | Poetry of Loss is delivered by Literature Wales, funded by the Welsh Government’s Cymru’n Cofio Wales Remembers 1914-1918 First World War Centenary Programme, and in partnership with the Government of Flanders and Snowdonia National Park Authority. First Minister of Wales, Carwyn Jones, said: “While the world lost a great Welsh talent when Hedd Wyn was killed aged just 30 years old, his legacy lives on in his poems and manuscripts. The wider Barddoniaeth Colled | Poetry of Loss project includes commemorative events in Flanders and Ireland; a writers’ residency exchange between Passa Porta in Brussels and Tŷ Newydd Writing Centre, north Wales; and the production of a new multi-media poetry performance, entitled Y Gadair Wag, to be toured in September 2017. Plus, the annual Glyn Jones Lecture will this year be delivered by Ifor ap Glyn at Hay Festival on the subject of Hedd Wyn (Monday 29 May, 7.00 pm). The digital programme for the event can be viewed here.